The small yet potent exhibition, A Home for Surrealism: Fantastic Painting in Midcentury Chicago at The Arts Club of Chicago, features the work of eight artists from the 1930s through the 1950s. 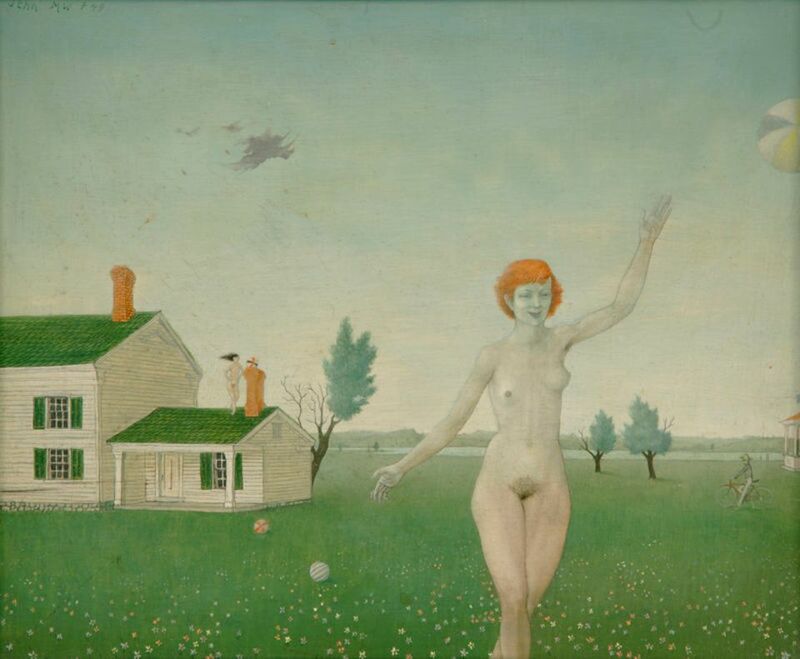 The title does double duty, referring broadly to the city’s embrace, by collectors and institutions, of European Surrealism, and specifically to a group of artists who shared the same aesthetic sensibilities, often using the home as subject matter —Gertrude Abercrombie, Ivan Albright, Eldzier Cortor, Harold Noecker, Julio de Diego, Dorothea Tanning, Julia Thecla, and John Wilde. When Mileaf assumed the directorship of the historic private club in 2012, she encountered a small work by Abercrombie (1909-77) in the collection. “I have to know who this is,” Mileaf says she told herself. She also vowed that if she were given the opportunity to mount a show with research, it would be on Abercrombie. Mileaf had written her dissertation on the objects made by Dadaists and Surrealists. “I was a scholar of Surrealism with no idea of what happened in Chicago,” Mileaf says. As she delved into the scene surrounding Abercrombie, who was known for her lively salons that included jazz musicians, she became equally smitten with Julia Thecla (1896-1973), a magical realist with a performative personal style that included walking her pet chicken on a leash. 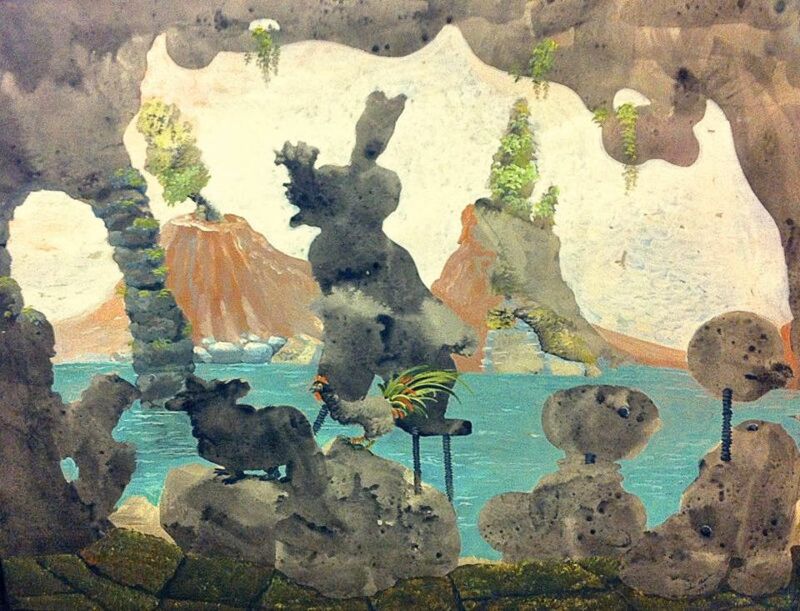 There are ten work by Thecla on display including a small fumage painting with tempera, charcoal and black ink on panel, Cave Entrance (1955), an absurd and mysterious landscape that Mileaf describes as being as worthy of attention as any smoke drawings by Max Ernst. Two years ago, when the Terra Foundation for American Art announced the Art Design Chicago initiative, offering support for exhibition development, Mileaf began putting together a checklist for the most ambitious loans. The Terra funding gave Mileaf a reason and way to follow through on her plan, which she broadened to include six other artists after consulting with fellow art historians and curators, including Susan Weininger, Robert Cozzolino and John Corbett. The earliest painting in this exhibition is by Ivan Albright (1897-1983), who did not identify as a Surrealist. “When a Time magazine reporter tried to label him, Albright responded by suggesting that Surrealism was passé,” the catalogue notes. “I don’t like tags,” he said. “Surrealism means 1941—and a New Year is just around the corner.” Wherefore Now Ariseth the Illusion of a Third Dimension, (1931), the only work by Albright in the show, is on loan from the Art Institute of Chicago. Mileaf was also able travel to the The Menil Collection in Houston to study the works by Dorothea Tanning (1910-2012) in their collection. There are seven of her paintings on display including a 1959 oil on canvas from the Menil, O Seasons! (O saisons!). As a nod to the organising concept of home, Mileaf installed a fireplace mantel in the gallery inspired by two images centred around a hearth, including one of Abercrombie standing in front of a similar domestic scene, The Past and the Present (around 1945). “It was a way of making our space more intimate and warm,” Mileaf says. The Arts Club began in 1916 as a way to present Modern art in Chicago. By 1958, the club had mounted 22 exhibitions featuring international Surrealist artists; Salvador Dalí attended the opening of his exhibition in 1941. The club’s focus was to bring in art that otherwise would not be seen in Chicago, so the work of the artists in this exhibition would only have been seen in their lifetime during the annual member’s show. While this exhibition is far from comprehensive, it sets the stage for a deeper investigation of Chicago Surrealism and for welcoming these artists home. • A Home for Surrealism: Fantastic Painting in Midcentury Chicago at The Arts Club of Chicago, unitl 17 August 2018.